Based upon a combination of high-quality optical components and sophisticated image analysis software, the Occhio 500nanoXY is a fully PC controlled system, include CFR21 part 11 software, for fast and accurate powder characterization. More than a microscope, the system combines an integrated vacuum dispersion device, monochromatic collimated back-light for ideal contrast, telecentric lens for unrivalled image quality, new fast auto-focus, integrated computer with 3 controlled position axes, and advanced software for size and morphometric analysis. This new particle size/shape analyzer allows measurement in dry and wet mode. Fully PC controlled system (fast auto-focus, Standard operating procedure) and CFR21 part 11 software. This newly patented dispersion device will provide perfectly prepared sample slides. The disperser is placed automatically onto the glass plate and a plastic membrane separates the sample form the chamber. The membrane is automatically ruptured by the pressure differential and the sample is dispersed directly onto the plate, creating a homogeneous monolayer of particles. Based upon a combination of mechanical and vacuum dispersion, ZEPHYR LDA provides for fast and accurate size and shape analysis. It can be used to substitute manual sieves analysis. Combined with the software CALLISTO, it is easy to use and perform analysis in few minutes. Dry dispersion by air flow. Dry powder, that falls from a vibratory feeder, is introduced into a pipe and dispersed by means of an aspiration system. Laminar air flow keeps all particles in focal plane. High resolution camera with telecentric lens takes crisp images. OCCHIO Instruments built-in a high resolution camera into ZEPHYR LDA to make possible the comparisons with other particle sizing technique like manual sieve analysis and laser diffraction. Change from manual sieve analysis to ZEPHYR LDA! Manual sieves analysis takes a long time and requires a full time operator. With ZEPHYR LDA just put the sample into the feeder and ZEPHYR LDA automatically completes the measurements. New feature: Automatic cleaning of glass plates. No contamination. No need to clean optics after analysis. Sieve distribution. Particle size and shape measurements. Particle counting with Flowcell (WET option). Kinetics mode. Sievecal is a fully automated instrument designed to provide pass fail compliance data for laboratory test sieves. With an average analysis time of two minutes, sieves are quickly and accurately verified for compliance to ASTM, DIN, or ISO standards. Based on image analysis measurement technique, Sievecal provides an entire scan of the sieves surface following a computer controlled standard operating procedure. Using sophisticated digital imaging hardware, and a robust software package, a pre-defined standard operating procedure makes testing sieves as easy as a click of a mouse. As the sieve rotates, the entire surface of the mesh is analyzed, providing real time information on wire thickness, and aperture dimensions. A full report is generated for each sieve, and can be printed, or saved as a file. Operator can define the minimum numbers of images (surface) or the minimum numbers of holes. Operator can define the holes detection parameters. Real time sieve opening measurement and sieve opening Idcard. Sieve size from 8 inches up to 12 inches (standard sieve support included). Sieve opening from 20 µm up to 12.5 mm. Sieve opening computing (Feret Min:X; Feret Max:Y; Max Distance: Diagonal Max inscribed disc). Acquisition and reporting software compliant with ASTM E11 Standard. Automated flat scanning table (sieve rotation and translation). Fixed working distance telecentric zoom, from 1.2 µm up to 22 µm resolution. High speed USB 1.3 Megapixel. Detection and counting of clogged opening (relative proportion). 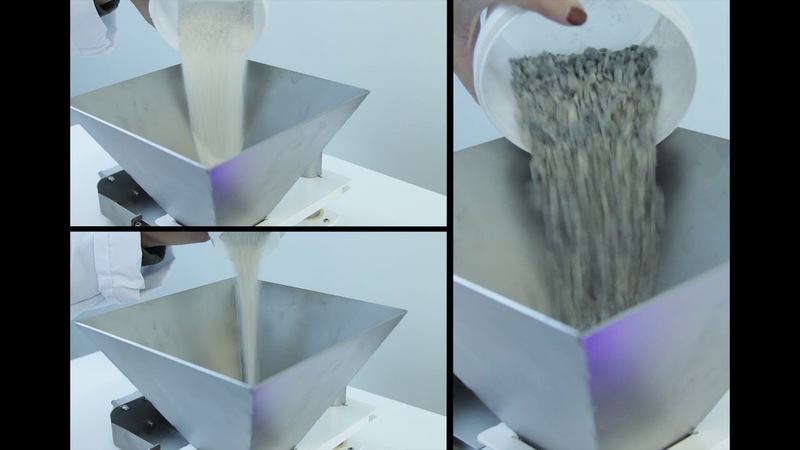 (fully automated scanning with a recover of minimum 90% of the global sieve surface). WET METHOD: PARTICLE SIZE – PARTICLE COUNTING – PARTICLE SHAPE. The particle counter by flow FC200S + HR was designed to count the number of particles per mL. Designed on the principle of image analysis, it is also used for morphological analysis. Thus, we can accurately identify each type of particle population in suspensions. For example, in a suspension of particles, it will be easy to identify and differentiate particles or droplets of water droplets or bubbles of air or other pollution. The FC200S + HR, benefits from the latest developments for the measurement of particle size from 200 nm. · Designed to work under hood. · Counting by image analysis technique. · Optical Bench resolution (from 200 nm detection). · Injection with pipette tip or tubing. · Control with Portable computer. · Special design + absolute count tracking. · Particle size distribution in number and volume. · More than 50 parameters analysis. This new algorithm can track the trajectory of particle. Aggregates of different densities and shapes have different mobilities. Thus the risk to count the same particle is high. With this algorithm, the particles are identified and counted just one time. Thus, we propose an absolute count 100% free overcounting. FILTRA VIBRACIÓN, S.L. has been proud to celebrate its 25 years in the market developing and manufacturing laboratory and industrial process equipment for the sieving of solids and liquids and for the mixing and milling of solids. The first production line is the laboratory equipment which includes a big range of sieve shakers (in diameters 200, 300, 400 mm) and sieves. The FILTRA’s Quality Assurance procedures are certified by AENOR according to the standard UNE-EN ISO 9001:2000 for manufacturing of laboratory test sieves -woven wire mesh and perforated plate- in diameters between 60 and 600 mm. We only use Stainless steel to produce the sieves, with the quality of AISI 304 and AISI 316 for food industry or some corrosive products. We also produce hammer grinding mills and V-shaped mixers (capacities of 0,5, 1, 2, 4, 8, 16 and 25 litres), with a high quality mirror polished finishing for an easy cleaning and a big durability. Regarding the industrial equipment, we manufacture several kind of sieves shaker: Circular sieve shakers with central and lateral motors, in diameters 300, 400, 550, 800, 1200, 1500 mm. and Centrifugal sieve shakers for big productions. We also produce Industrial V-shaped mixers, from 25 to 500 litters of total capacity. Our technical Office design and adapt the complementary accessories needed to integrate these machines to the production line of customers. Another production line is the industrial filters made-to-measure according to customer specifications. Following with our policy of Innovation and Quality, FILTRA is continuously improving the existing products and developing new ones. Our customers appreciate very much Filtra products, all of them manufactured in Spain, because we offer a very good quality with a very reasonable price.